STIRLING – Every Wednesday evening from 6 to 8 p.m. the Stirling-Rawdon Public Library hosts free genealogy sessions for people to explore their family history. 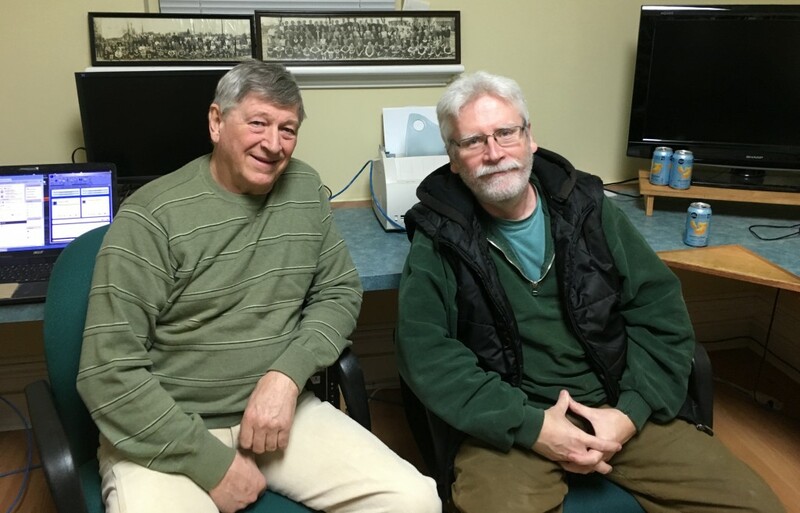 John Docherty and Phil Martin have been volunteering together at the library since the program began 12 years ago. Both are local men who, like many others, wanted to explore their family history. Inside the office is a large selection of books and documents detailing family histories from the Stirling-Rawdon area. Ancestry.ca is the primary online research tool they use. “The fee to use the ancestry website at home is $300. Here at the library it’s free,” Martin explained. Docherty and Martin help people in the community like Robert Taylor and Norma Sedgwick, a couple who have both been avidly researching their family backgrounds. Taylor and Sedgwick returned from a trip to Illinois this past September where, with the help of Docherty, they’d tracked down the graves of Taylor’s great-great grandparents on both sides. Sedgwick had just finished a project for a friend of hers who didn’t know anything about her father’s side of the family. Part of the problem was that a Roman Catholic had married a Protestant, which in the 1800s, as she puts it, “wasn’t the best of situations.” She had lots of information on her mother’s Protestant side but not on her father’s Catholic side. Sedgwick now has 1,180 names filled in her friend’s family tree, people her friend didn’t know existed. As Docherty put it, “sometimes you find out stuff that nobody talked about.” More often than not people learn of situations that their families covered up due to the nature of the event or the time in which it took place. The men said that people usually don’t start looking into their genealogy until they are middle-aged. “I didn’t get interested until I was 40 years old,” Docherty said. Even when younger people do come in to research family history, they are often doing it for an older person, Docherty and Martin said.